Learn more about our Organization of the Month here. The National Runaway Safeline (NRS) is pleased to announce March’s organization of the month, Mujeres Latinas en Acciòn (Latina Women in Action). While our main focus here at NRS are runaway and homeless youth, we do receive calls from women who are in need of help. It is always great when we come across agencies in specific cities to which we are able to refer our callers. Mujeres is one of the nearly 10,000 resources in NRS’ database. One of their priorities, like ours, is homelessness prevention. With their extensive database in the Chicagoland area, women are given plenty of emergency shelter resources as well as resources for transitional living programs. Mujeres is a bilingual and bicultural agency that provides services to Latinas and is located on the Southside of Chicago. 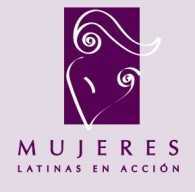 Mujeres is the longest standing incorporated Latina organization in the nation. Founded in 1973, Mujeres Latinas en Accion (Mujeres) empowers Latinas by providing services which reflect their values and culture and by being an advocate on the issues that make a difference in their lives. With this mission and the needs of the community always at the forefront, Mujeres provides high-quality, client-centered human services addressing critical issues such as domestic violence and sexual assault, leadership and youth development, positive parent support, and homelessness prevention. Mujeres also acts as a leading advocate on critical issues to ensure that the voices of those in the communities served are recognized among local and national lawmakers. As the oldest Latina-led, Latina-serving organization in the country, Mujeres has ascended to become a national model for culturally proficient services focused on Latinas and their families. All programs offered are bilingual and bicultural in nature and reflect a true understanding of the community the agency serves. Programs form an easy to navigate pathway designed to take a client from a place of crisis and uncertainty to where she may take advantage of the systems in place all around her to guide her to self-sufficiency and a place of family and community leadership, depending on her goals. Mujeres will be celebrating Women’s History Month by having their annual benefit, Voces Unidas (Voices United), and honor Latina women for their exquisite leadership as well as inspiring leadership.